It’s been another eventful week in the world of football. There’s just no day without any football headlines. Let’s start off with the biggest news in English football this week. England boss Fabio Capello has resigned from his post! It comes as no surprise to me! Fabio was never the man for the job, and England never did anything notable of sort under him. Instead, they went on to make more bizzare headlines. After Steve Mclaren was shown the door, for not qualifying for Euro 2008, Fabio Capello was appointed with a huge pay packet to lead England to its next 2 major competitions, World Cup 2010 and Euro 2012. And all of it had its fair share of drama! Of course, there was the 2-1 win in Berlin over Germany, and the 4-1 beating of Croatia, Theo Walcott scoring a hat-trick. Then, John Terry was stripped of his England captaincy, after he was involved in a sexgate scandal with ex-England and Chelsea teammate Wayne Bridge’s ex-girlfriend. It became a huge media sensation, with Wayne Bridge refusing to shake Terry’s hand in a game between Chelsea and his new team Manchester City. This affected their World Cup preparations, as they huffed and puffed their way through an easy group comprising the likes of United States, Algeria and Slovenia. After that, they got spanked by the Germans 4-1. Capello was heavily criticised for his methods. First, he was accused of employing fascist rules in their training camp, with a strict regime. Players weren’t allowed to voice their opinions over tactics and formations. Steven Gerrard was played on the left side of midfield. Moreover, Capello had selected mediocre internationals like Ledley King, Emile Heskey and Robert Green, the latter guilty of a high-profile keeping error against the USA. The FA decided to stick with the Italian manager, as they bid to qualify for the 2012 Euro. John Terry was reinstated as captain, as England managed to seal their place in the competition. On the way, Wayne Rooney recieved a suspension that will see him most of the group stages. Coming to the resignation, again there was the involvement of messrs John Terry. He was alleged to have racially abused QPR defender Anton Ferdinand, in a Premier League game at Loftus Road. This lead to him being stripped of captaincy yet again. And, also an interview by Capello in the Italian media stating that Terry shouldn’t have been punished until he was proven guilty in the court. However, this was a decision, the FA say they had taken with the full consent of Capello himself. The FA saw this as a breach of contract and that’s that. England seem to be heading to another tournament, courting disaster. The man who is leading the contender’s list to take over the job is none other than another man embroiled in controversy, the Tottenham manager Harry Redknapp. The burly manager, whose wife is supposed to have better finishing skills than Darren Bent, was recently acquitted of all charges. First, he was accused of illegally tapping up players. He was secretly filmed to have tapped up Blackburn player Andy Todd. Then, there was the tax evasion trial, where ex-Portsmouth chairman Milan Mandaric is alleged to have transferred enormous sums of money into Redknapp’s Monaco bank accounts. Let’s see where this circus moves on to next! Moving on to another part of the world then, to the Africa Cup of Nations. Arsenal had two representatives in the games. While Marrouane Chamakh has returned back to London, without as much as a goal, Gervinho has been putting impressive performances for Ivory Coast. The Ivory Coast have now reached the final, where they will play the surprise package of the tournament Zambia, who beat African giants Ghana. Gervinho netted a wonderful goal against Mali in the semifinal. He picked the ball near the halfway line and ran unchallenged to slot the winner. This would mean Gervinho will start for his nation in the final on Sunday. Meaning, he could be in the team for the FA Cup 5th round game at Sunderland on 18th Feb. Speaking of which, Sunderland took 113 minutes to beat Middlesbrough in their 4th Round FA Cup replay at The Riverside Stadium. This can only bode well for the Gunners, as they hope to face a physically drained Sunderland side, in their search of 3 points. What goes around, comes around. In a weeks time, Arsenal face the Black Cats again, on the bounce of their mammoth Champions League clash with AC Milan. Think it’s time for a cat nap, I ran my legs off tonight in true. Fernando Torres reportedly jealous I got a bigger cheer than he has all season! What’s more, it seems like cats are going to take over the world. 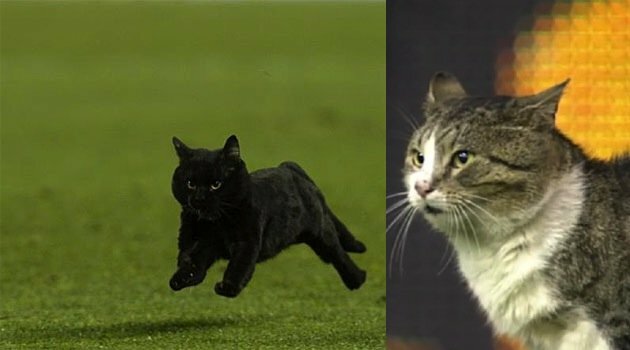 Just a day earlier, a black cat ran the length of the pitch at Nou Camp in a game between Barcelona and Real Socidead! Of course, it was no bad omen, as Barca beat Sociedad 2-1. Carlos Vela scored Sociedad’s goal. And now we jump topics again. Carlos Vela says he prefers staying in Spain rather than return to London. I am happy and the people support me. I owe Arsenal affection and gratitude for the opportunity that they gave me, but I was not happy there and this affected my work. It was hard day to day and, when it came to training, I was thinking about going home. Here, however, I am happy and have made good friends. I am not too sure, what Arsenal could miss, should Vela not return to Arsenal. He has not lived up the earlier potential he showed, and has so far been the poorer cousin of Javier Hernandez. Speaking of poorer cousins, there seems to be lots of connections between Manchester United and Arsenal here. Park Chu-Young just can’t seem to get a game at Arsenal, and has been dubbed the poorer cousin of Park Ji-Sung. Even when the Gunners were leading 6-1 against Blackburn, Arsene Wenger decided him to leave him on the bench. With just one year of a proffessional footballing career left for the South Korean, after which he has decided to join the military, spending it on benches or occasionally in Arsenal reserve games is not what the South Korea captain has in mind. His agent revealed that he could be on the move this summer. And why shouldn’t he? He is the captain of his country, and was snapped up right under the noses of Lille from Monaco in a last-minute deal, only to be a makeweight. He has been one of Le Proffeseur’s most puzzling signing. Speaking of signings, Arsenal have been linked with two more players in the French Ligue 1, more notably Eden Hazard, with the other being Montpellier striker Olivier Giroud. Giroud is being closely watched by Arsenal’s scout in France, former Arsenal defender Giles Grimandi, who says the club is closely monitoring nearly 20 players. Speaking of 20, it is the number of games Giroud has played this season, scoring 15 times.Speaking of 15 and 20, it is that number when converted into millions of pounds, that Arsene Wenger says Arsenal should be making as profits, if any summer move for Eden Hazard is to be made. Recent rumours of Thomas Vermaelen and Eden Hazard being cousins (not poorer) have been quashed. (From where do these come anyways? ), with the manager saying he likes the Belgian winger for his pace, vision and his ability to unbalance opposition defences. It remains to be seen which club Hazard will turn out for next season, after saying he sees himself playing in the Premier League come August. Hazard should he arrive, will be vying for a place in the first-team with the vastly talented Alex Oxlade-Chamberlain, who has come out recently in the media stating that he is happy to learn new things in training from Thierry Henry and Robin van Persie. I listen to everybody. People like Thierry and Robin who score goals and are attacking players like myself, you can always learn a lot from them. That’s all I do, I listen and learn.I have belief in myself and in my own ability. I just know that I have to keep working hard and learn off the boys, and then hopefully the rest will come. At the moment it’s going quite well for me so I’m just going to keep working hard. His captain and manager insist on keeping a low profile for the England youngster, in a way to try and protect him from the hype that may turn him into another Pennant or a Bentley or a Bendtner. However, the players’ recent performances have attracted interest from lots of quarters, with many pundits claiming he can be the surprise package for England in the European Championships. Speaking of highly talented Arsenal youngsters, another one that springs to mind is Emmanuel ‘Dench’ Frimpong. The young defensive midfielder made himself a crowd favourite after he hassled and harried $amir Ca$hri in a Carling Cup game against Manchester City, so much so that Ca$hri wanted to go off when the fourth official raised his board, for a different City substitution. He was then loaned out to Wolves, to make sure he gets some first team Premier League action. However, despite ‘Frimponging’ Rafael van der Vaart, he has been the receiving end of ‘Frimpongs’. First, he suffered a facial injury when Stilian Petrov. After initial fears that he could be out for 3 months, he returned to action. But, again, he ruptured his anterior cruciate knee thanks to Joey ‘Brute’ Barton against QPR. This injury means he could be out of action for nearly 8-9 months. He was a crowd favorite at Wolves too, with constant chanting of ‘Deeench’ and ‘Frimpong’. Both Wolves and Arsenal released a statement. Everyone at Wolves would like to thank the midfielder for his efforts whilst at the club and join Arsenal in wishing him a swift recovery. Speaking of recoveries, Johan Djourou, who had returned from a long-term injury last season, has supposedly signed a 2 year contract extension, if Swiss newspaper reports are to be believed. I am not too sure how to react, but then again, it doesn’t sound so bad. Djourou has been played out of position, more often than not, this season. He has nearly 130 Arsenal appearances under his belt and is a Swiss regular, so it won’t be bad to have a international defender in reserve. Hopefully, his best years are ahead of him. Moving on to the big game of the weekend then. No, I am not talking about Sunderland vs Arsenal. I am talking about Manchester United vs Liverpool, in the early Saturday kickoff. I am expecting a lot of handbags in this game, considering how much tension there has been between the two rivals off late. First, Liverpool fans have all been quiet for a while now, considering they are off the perch, now occupied by their fiercest rivals. And to put salt to wounds, they had their best striker handed a ban, that could have affected their entire season. The Patrice Evra-Luis Suarez row has been one of the major talking points this season. Whether Suarez racially abused Evra or no, I am not sure, but about the match being a feisty clash I am sure. The earlier Premier League match between these two teams at Anfield, was one of the worst matches I saw. Both teams stifled each other out. The FA Cup 4th Round clash was quite exciting, and Liverpool put one over United, by scoring an 88th minute winner at the Kop, through Dirk Kuyt. Suarez is expected to start this one, after he came on as a substitute against Tottenham. Ok, that’s enough talk about Liverpool, racism and the Ku-Klux-Klan. 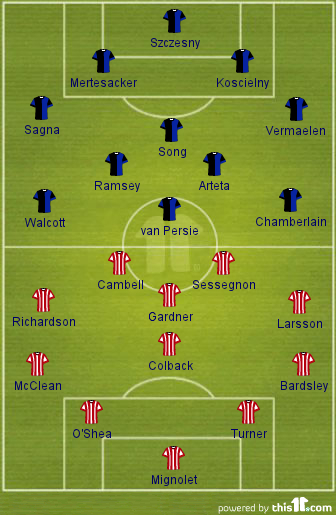 Now to the other big clash at the Stadium of Light between Sunderland and Arsenal. While Arsenal are riding high on the 7-1 mauling of hapless Blackburn, Sunderland, themselves are on a high, after ousting neighbors Middlesbrough in the FA Cup 4th Round, and having won 7 of their last 10 Premier League matches, which included beating leaders Manchester City, since the arrival of Martin O’Neill. They have a team, mixed with experience and youth of the right amount. They have lot of ex-Manchester United players, the likes of John O’Shea, Fraizer Campbell, Phil Bardsley, Kieran Richardson and Wes Brown, who is injured, as well as former Arsenal midfielder, Sebastien Larsson, who has been their star performer this campaign. Martin O’Neill could make some changes, considering their midweek exertions against Boro, where they played out 120 minutes of draining cup football on a chilly night. But, then again, he wouldn’t want to change his winning formula. It will be interesting what team is put out on Saturday. Meanwhile, Arsene Wenger is cautious about the return of Kieran Gibbs. He is still probably a week away, and will not be expected to start at the Stadium of Light or at the San Siro. He is however expected to feature in the 5th Round, again at the Stadium of Light. Thomas Vermaelen will continue at left-back, and Bacary Sagna will take his place at right-back, replacing Francis Coquelin. It will also be interesting to see whether Aaron Ramsey or Tomas Rosicky will start beside Mikel Arteta in midfield. My hunch is Aaron Ramsey, after his 10 day rest. It must have surely rejuvenated the young Welshman, who has started most of the games this season, and will keep him fresh during the business end of the campaign. It is going to be a tough game for both sides. And, this is probably Arsenal’s most important week of the season. We face Sunderland again in the FA Cup, and in midweek AC Milan at the San Siro. Hoping we kickstart a good week on a positive note with 3 points. Thanks for bearing with the ‘Speaking of which”s!! Previous: How It Could All End up this season?